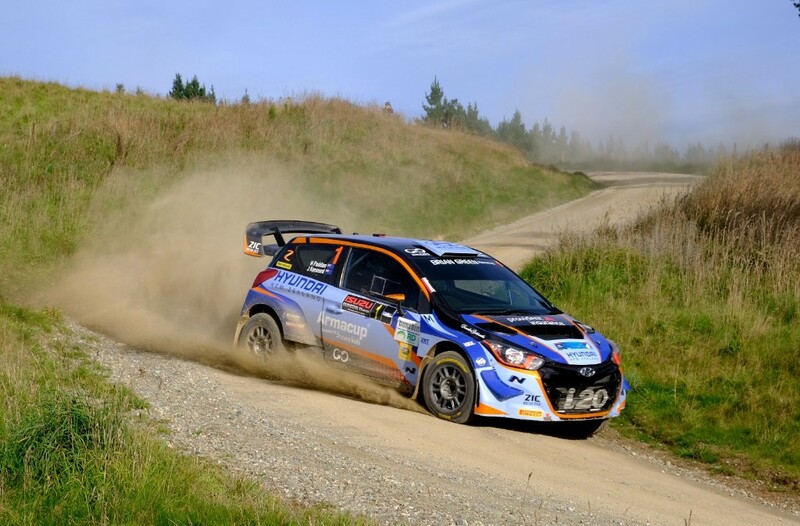 Hayden Paddon stormed to a convincing win at Rally Otago in the first round of the Brian Green Property New Zealand Rally Championship on Sunday. The Hyundai WRC star, alongside co-driver John Kennard, eased to a 8:27.7s win to start his five-round domestic campaign off in sparkling fashion. Local driver Emma Gilmour and co-driver Anthony McLaughlin looked set to complete a terrific weekend going into the final stage in third place overall in her Suzuki only to see a great result desert her when she got a puncture in a difficult place. Matt and Nicole Summerfield inherited third place in the Mitsubishi Mirage – their first outing in the new generation car. It was an up and down weekend for the pair as they got used to the new car but Summerfield was pleased to get to the end and bank some valuable championship points. “When it is good I am happy – it is just a case of making that more of the time than not,” Summerfield said. “There were a few scares in there but all in all we are here, the car is good and straight, we know it is fast so it is just a case of miles.” They had a time penalty applied to their Saturday time however, which saw them drop from third to fourth for the day. That was the one positive for a distraught Gilmour as she inherited the podium spot for day one. Josh Marston and Andrew Graves came home fourth in a stunning result for the Holden Barina. Graham Featherstone and Dave Devonport finished fifth in the Mitsubish. Raana Horan and co-driver Michael Connor were awarded the Dunlop Drive of the Rally for their outstanding sixth place overall in just their second NZRC event. Dylan Turner and Malcolm Read were in-line for a top five finish until their Audi clipped a fence post on the inside of a corner late on Sunday while former Supercars driver Greg Murphy showed improved pace during the event, picking up two top-four stage times on Sunday before he was troubled by a fuel-line issue that dropped him down the order. Dylan Thomson and Amy Hudson took a comfortable victory in the NZRC 2WD class. “We are stoked to come away with the win,” Thomson said. The youngster picked up the Hella Moment of the Rally for an incredible drive on the famous Kuri Bush stage on Saturday, where he recorded the eighth fastest time overall in the Ford Fiesta. “We’d had a bit of a quiet day up until then,” Thomson explained. “We did everything to make sure we could go as fast as possible in that stage – we conserved tyres in the stage before – and from the start line it was absolutely flat from there. Every corner was 100 percent commitment and nothing less so we were stoked with that.” David Taylor and Jared Hudson finished second in the class in the Honda Civic while Amy Keighley and Andrew Smith were third in the Suzuki Swift. Regan Ross and Samantha Gray claimed top prize in the Historic Rally Championship while also winning the Otago International Classic Rally. They led home John Silcock and Richard Atkinson’s Mazda RX7 in second with Andy Martin and Matt Hayward third in the Mazda RX3. The championship continues next month at the International Rally of Whangarei.